I finished up BWOF 2-2009-124 in a rush job on Saturday morning so I could wear it to a wedding that afternoon (I took the pictures just outside the reception venue - at South Lake Union for you Seattleites). 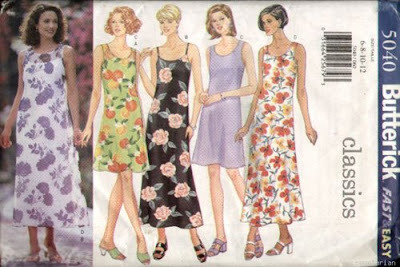 A lot of people have had success with this pattern but it was really Allison's versions and praise that sold me. I agree that it's a great, versatile pattern to have in your arsenal. Fashion fabric: 100% cotton print from Nancy's Sewing Basket. Yes, it's actually brand new fabric I bought specifically for this project and not something that I inherited from someone's 15 year old stash. It didn't seem so 90's on the bolt, really! Anyway, it's got a really nice texture, I would have assumed it was linen if I hadn't known otherwise. I omitted the facings and added a full lining. 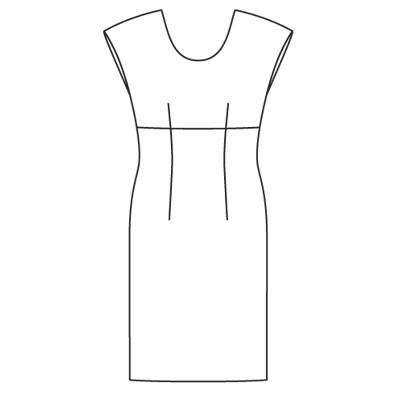 I assembled the dress and the lining separately, then stitched them right sides together at the neck, understitched, and flipped the lining to the inside. I could have used the all-in-one facing/lining technique that I recently practiced, but because I was rushed I decided to go with what I knew for sure would work for me. I machine stitched the lining to the zipper. I treated the lining and fashion fabric as one at the sleeve hem. I turned under the raw edges once, stitched those down, then turned it under again and hand stitched the hem. My iron ate my dress! I had just inserted the CB invisible zipper, and as I was flipping the dress over on the ironing board, the zipper pull somehow landed exactly in between the soleplate and body of the iron, and it would not come out!!! I tugged, yanked, pulled and pushed. Wouldn't budge. Tim came to the rescue by inserting a screwdriver in the space and wedging it open enough for the zipper to be freed. I wore my most edgy, contemporary shoes to counteract the 90's vibe of the floral print. I think it helped :) I will definitely make this pattern again, what I love is that it only has 4 pattern pieces (if you omit the facings) and uses only ~1.5 yds of fabric. I might try raising the back V-neck for something more work appropriate. What a lovely dress! I really lke the back! I like this - it looks good - have you thought about putting a belt with it will help delineate your waist a little more...a thin black belt might do the trick for you. Cute dress. It's very becomming also. Lovely dress - fierce shoes! You look fabulous. Agree that changing the back (although it is great) would make it more work friendly. It looks great on you. I love the shoes! It looks cute on you - I agree with the thin black belt comment above. But it doesn't look too 90's. The shoes are great with this. Very cute! I know that rush feeling to get a garment done for an event! And Murphy's law is right--what is the chances of a zipper pull getting stuck in the iron!! Made me laugh and sympathesize at the same time! As always, I'm so impressed with your sense of style. Your dead on that it's the spacing that's impacting the look you want. But, I actually think it's cute and the shoes are amazing. A. Mazing. Should have pinched those and the sunglasses when you weren't looking. Love that the iron ate your zipper! Yay Tim! I like the back a lot. I loved this post! Very funny! I agree with you that the print is a little 90's, but totally understand why you couldn't tell that it was on the bolt. Makes me kind of scared to buy prints now. ;) I agree with the other person who suggested a skinny belt. I think you look cute in that dress. Maybe some time will make you like it more. I admit, I'm no wizz at maths, but I'm not seeing the 90s vibe there at all. It looks great and summery to me! I just love that entire outfit. Of course, I love the shoes!!! Love your equations! The shoes def counteract the 90s vibe. You might also experiment with length--I just made this and hemmed it a couple inches above the knee. I don't think the style is perfect for me, but the shorter length helps. I didn't pick up a 90's feel from the dress but I had shoes highly similar to those in the mid 90's lol. The whole looks is fab!! No way! Not bad 90's at all. It does have a classy retro vibe, maybe 40's-50's? The shoes bring it into the new millenium. Your "adventures" in sewing it give it even more character. You look hot! LOL... You are funny:) I think the dress still looks cute even if it is 80's or 90's looking. Super cute! From the pictures, I'm not really seeing the 90s vibe that much. I love it! Okay, I don't get the 90's vibe from that dress at all. I do agree with the 40's/50's vibe idea though. Also, that back isn't work appropriate? Really? It's been years since I've worked in a corporate or conservative environment so I really have no idea. I've been in PR, publishing, and now work for the VA State Gov. and that would be fine in any of those. What are you talking about?! This dress isn't dated at all! It's perfect as is and very au courant, my dear. And my iron starting spewing a blueish liquid last night, like it was throwing up a crayon it had eaten while I wasn't looking. All over my daughter's new white shorts. (It did come out, fortunately.) I hate it when irons are bad children! This is why every woman needs at least one pair of fierce shoes in her arsenal. Now tell me about that clutch! I don't think the dress is quite as bad as you are making it out to be, it's got potential! You styled it great, but I do like the belt idea too. With those fabulous shoes you were never going to look 1990s! You look great. I reckon (my opinion only, for what it is worth) that the dress would look more of-the-moment if it had a slightly different front neckline...maybe a little higher and wider tending to boat shaped...or maybe a V neck. I can never pull of the moderate scoop neck. But actually, you look great and it is only a sewer who would have these opinions. Your post did make me laugh though...I find my 80's pattern more scary than my 90's ones. You look FABULOUS!!! And the colours are nice!! Cute dress and great save by your Tim. With those shoes no one can call this outfit dated, it looks fantastic on you. really like your sleeve lining treatment and I am amazed you were calm enough to take a photo of your iron eating your dress! You look fabulous and I love the shoes. The proportions are exactly right. That is one great dress on you! Gosh, I love everything that you make! I think the dress has more of a vintage feel than a 90's one. Glad you managed to save the dress from the iron. Love the shoes! Fabulous dress and the shoes are to die for. 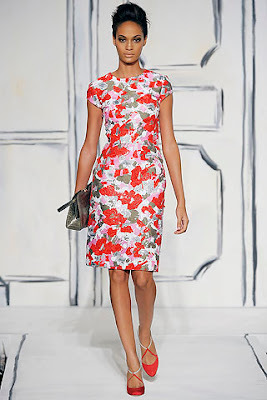 Love the print and you look really amazing in this dress. You know, it looks great. If I was styling you, the only change I would make is to shorten it a tad. You're young and gorgeous, so why not? The model is showing her knees and I think if you were it would modern it up some more. Love the shoes! I really must get around to making this dress!! I think it's vintage all the way. speaking of fierce, you have fierce sewing mojo right now!! I love it! And you styled it really well with those fierce shoes (LOVE them too!!)! Maybe it's a little 90s, but having lived through the 80s, I don't find that too scary at all. I'm with some of the suggestions above, definitely a narrow belt and maybe hem it up a little. And if you ever get tired of those shoes, and Cidell doesn't steal them first, I. Want. Them. Christina .- that beautiful style of the last two dresses. I like a lot, really.